I have not forgotten about my Good Eats blog project. Rather, I was waiting for Ted to feel good enough, after finishing chemo and radiation, to truly be able to enjoy Alton’s recipe for lobster. Exactly two weeks after completing treatment, he felt up to sitting down to a lobster dinner. This was to be my first time eating lobster… and it was to be prepared by me. Yep, I had waited 34 years to try lobster. How? I don’t know. I had eaten lobster macaroni and cheese, but never had I tried a whole lobster, or even a tail. The opportunity had just never really presented itself. This past Friday, Fed Ex arrived at our door with two live hard shell lobsters from Maine; our lobsters were 1.5 pounds each. Living in the Inland Northwest, live lobsters are not particularly abundant, so having them shipped to our door was the easiest way to get them. In the episode, Alton explains that you really want to get hard shell lobsters, rather than soft shell lobsters, because they contain more meat and have a firmer texture. 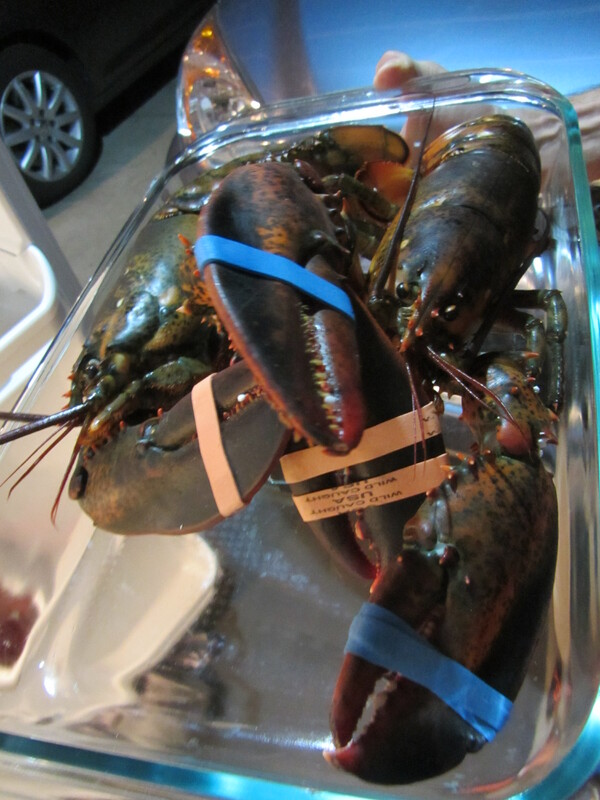 Soft shell lobsters have shells that are partially full of water, which you end up paying for. 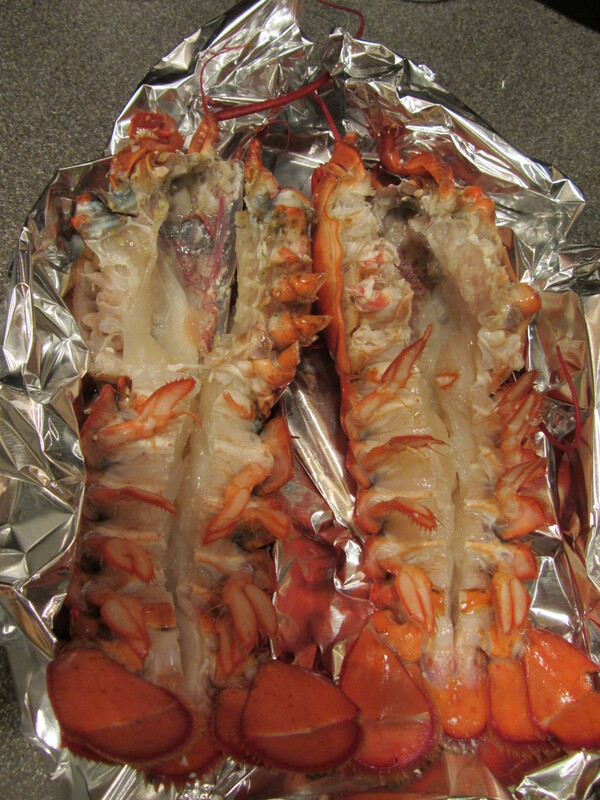 Our lobsters spent the day in the crisper drawer of our spare refrigerator, covered with damp newspaper. I was tempted to name them, but Ted said we shouldn’t name critters that we were later going to consume. 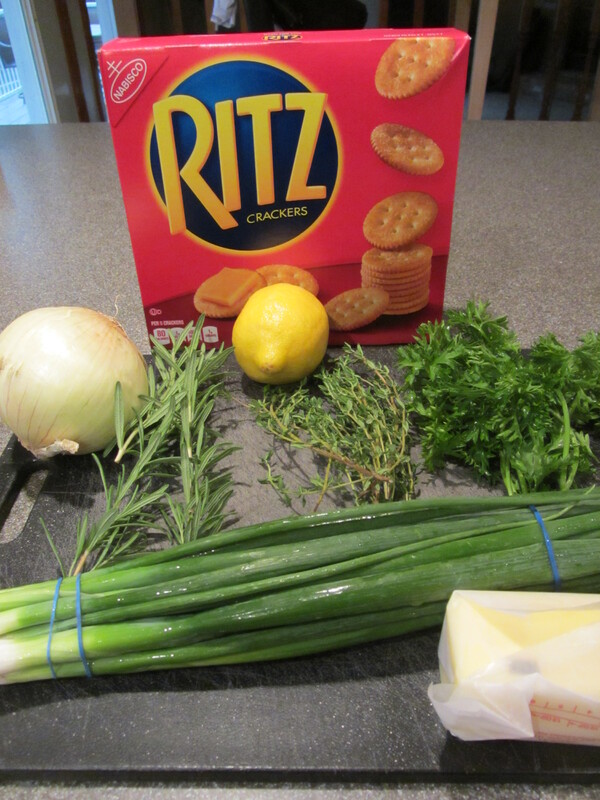 Ingredients for stuffed lobster: Ritz crackers, onion, lemon, thyme, rosemary, parsley, scallions, and butter. 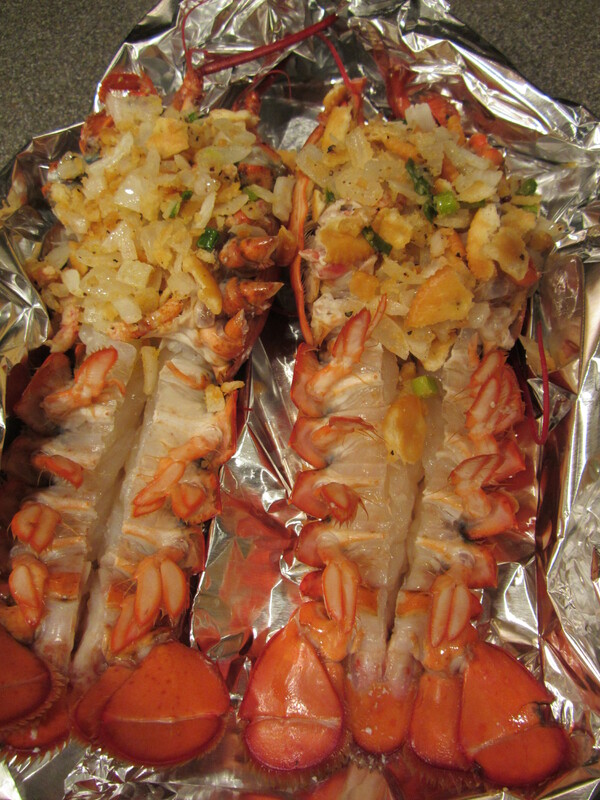 When you are ready to cook your lobsters, stick them in your freezer for 15-20 minutes. An uncovered roasting pan works fine for containing them. Live lobsters heading into the freezer for 15-20 minutes. Putting them in the freezer serves to numb them sufficiently before they are cooked. If you feel up to it, the other way to kill your lobsters is to cut their heads in half with a knife. I opted for the less gruesome former method. 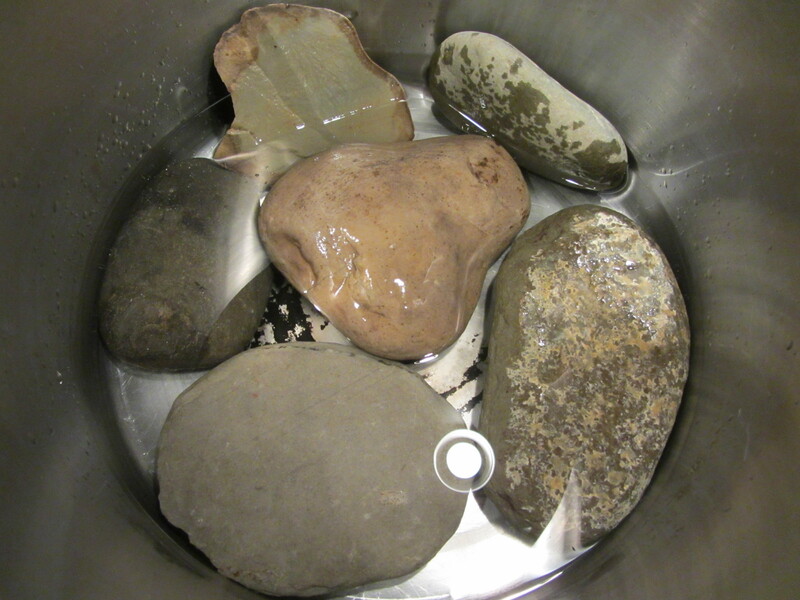 While the lobsters are numbing in the freezer, fill the bottom of a large, wide, lidded pot with a layer of river rocks and an inch of water. Pan with rocks and water. I used rocks from the front landscaped area of our yard. Bring this water to a boil over high heat. 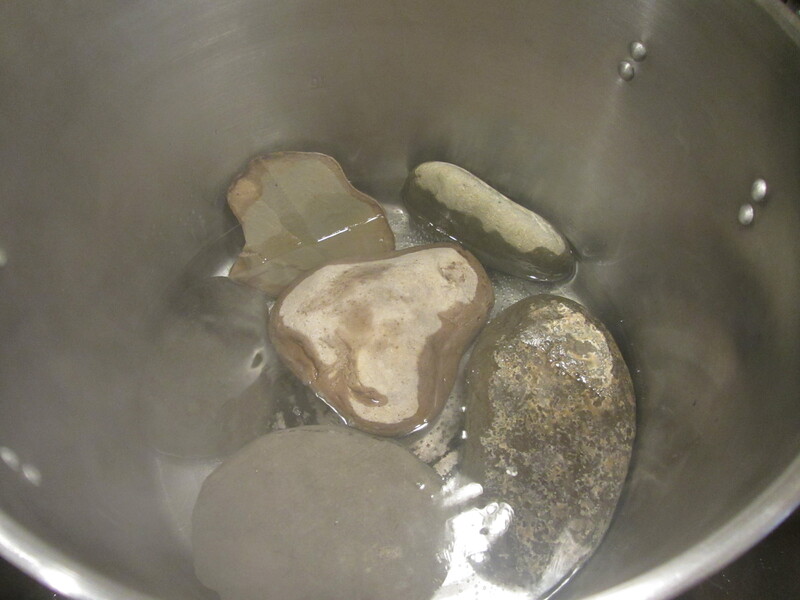 The rocks help to evenly distribute steam and also can prevent the lobsters tails from curling under. 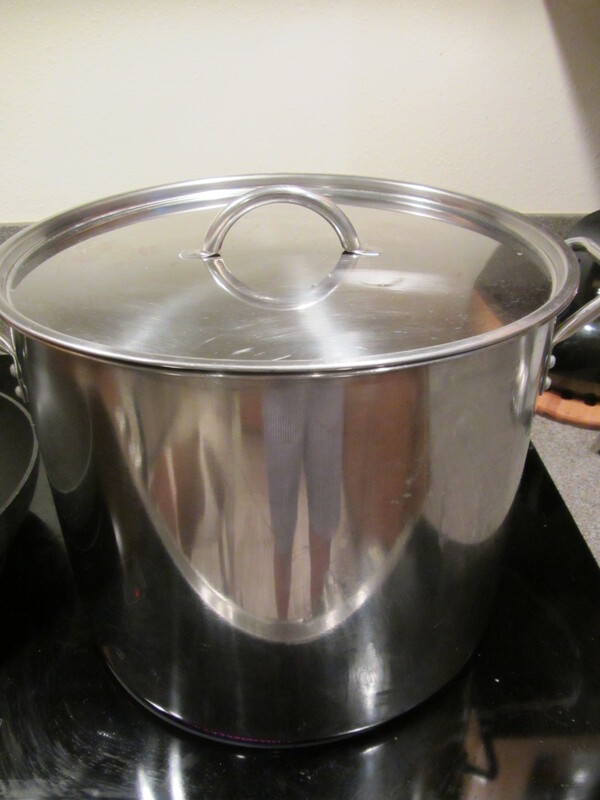 You want your pot to be ready to go when you pull your lobsters from the freezer. Steaming pot, ready to go. When your pot is ready, throw some sprigs of fresh rosemary, thyme, and parsley on the rocks, and carefully/quickly place your lobsters on top. Numbed lobsters, ready to go in the pot to steam. Place the lid on the pot and set your timer for two minutes. Alton says your lobsters will be dead within ten seconds. I forgot to throw my fresh herbs in, so I tossed them on top of the lobsters and let them steam for an additional minute. 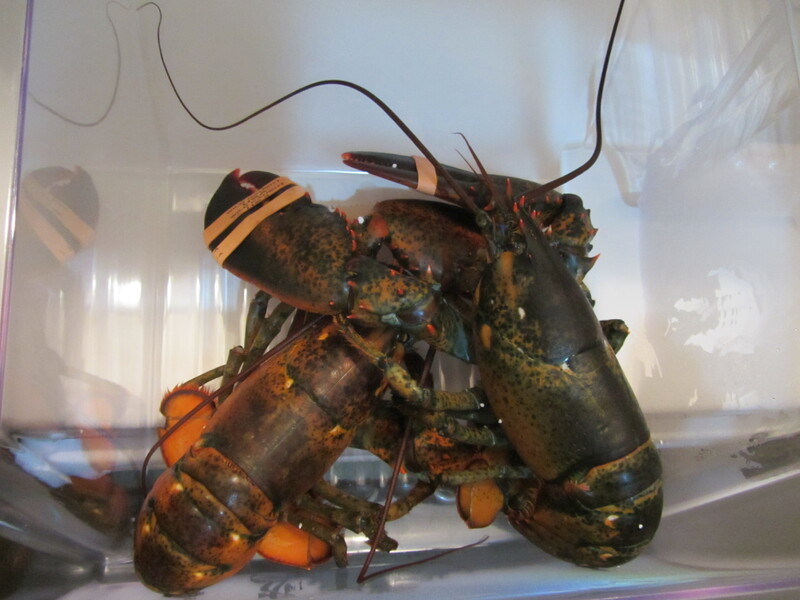 When your two (or three, in my case) minutes are up, place your lobsters immediately in an ice water bath to halt cooking. I used my kitchen sink for this. Ice bath to halt cooking. 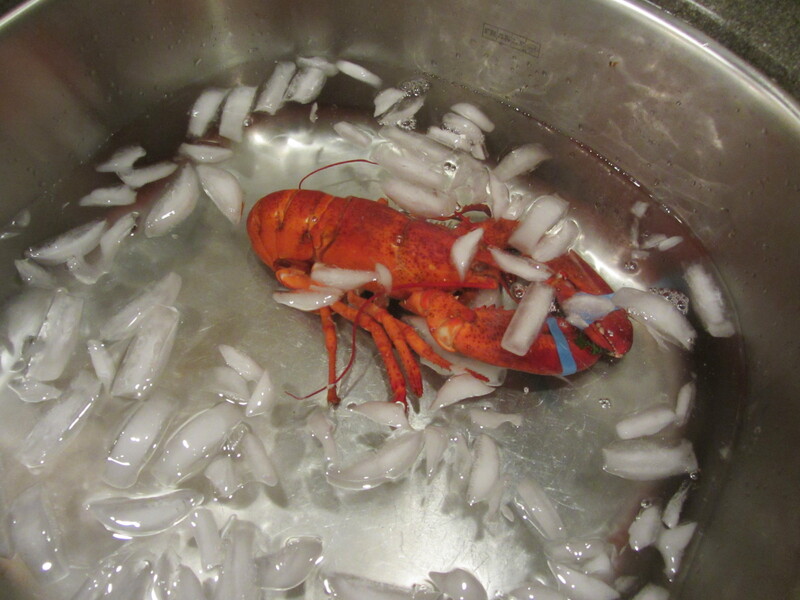 Par cooked lobster in the ice bath. 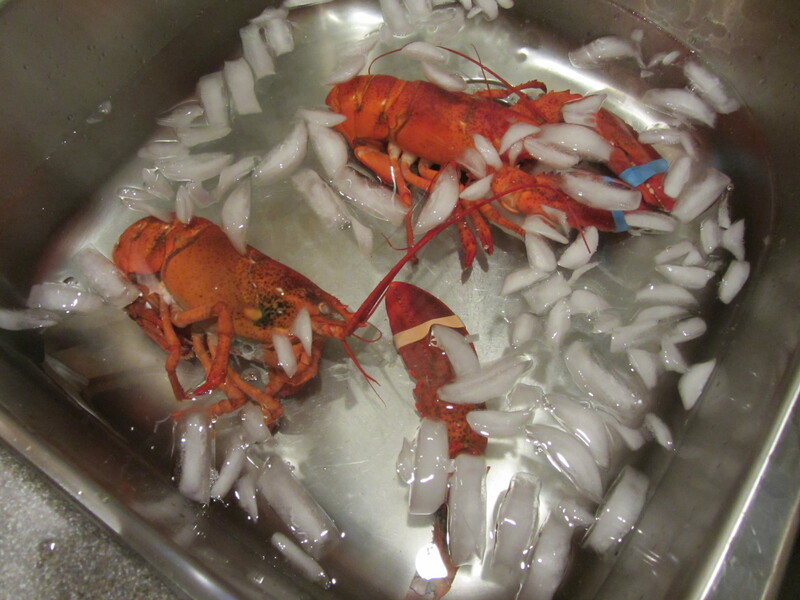 Both lobsters in the ice bath, along with the claws that broke off of the one lobster. 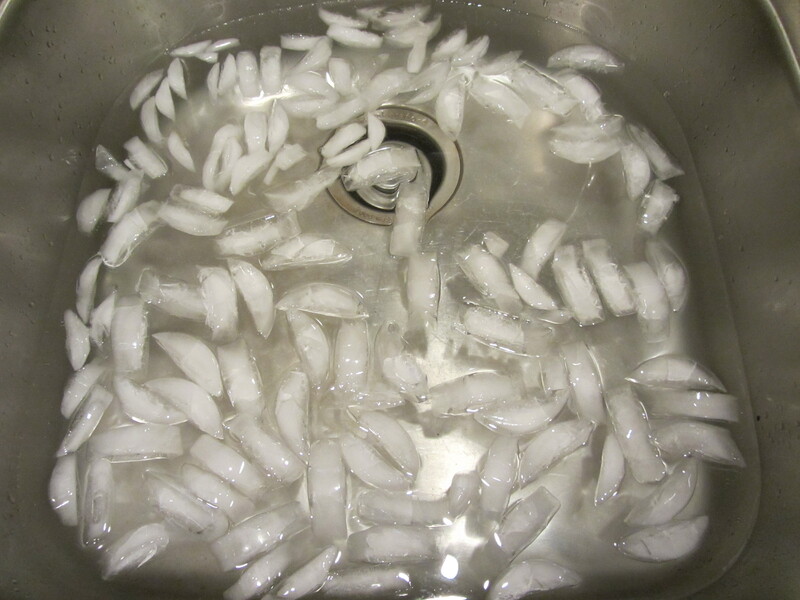 You want to let them sit in the ice water for 10-15 minutes. 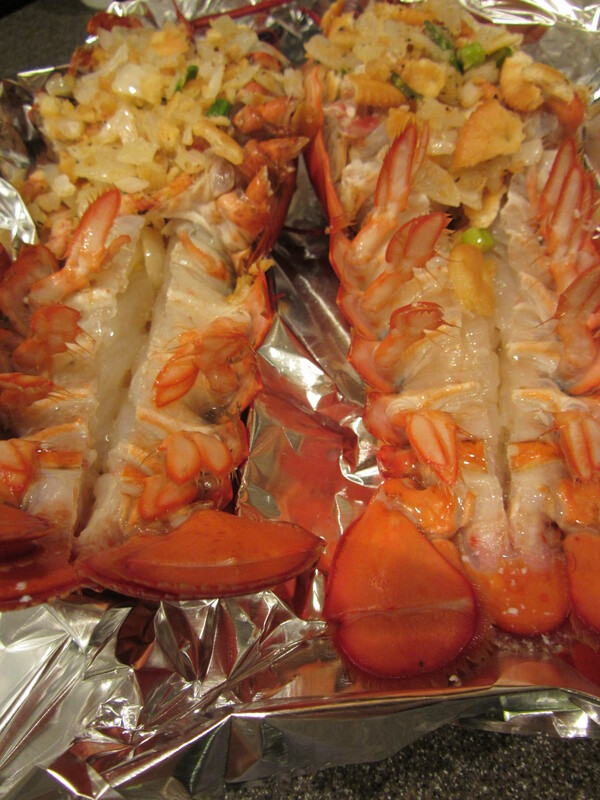 Essentially, you are par cooking your lobsters, as they are not fully cooked at this point. Somehow, one of my lobsters lost its claws in the steaming pot, but that turned out to be no big deal, and I just threw them in the ice water too. 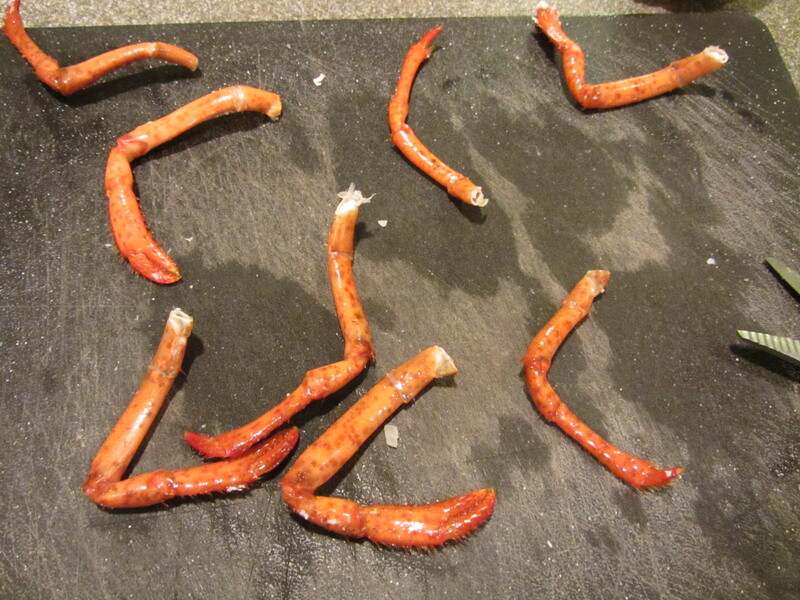 After their chilly dip, it is time for the gross part of the preparation. Placing a lobster on your cutting board, and using a large chef’s knife, you want to cut the lobster in half lengthwise, from the midpoint to the head. 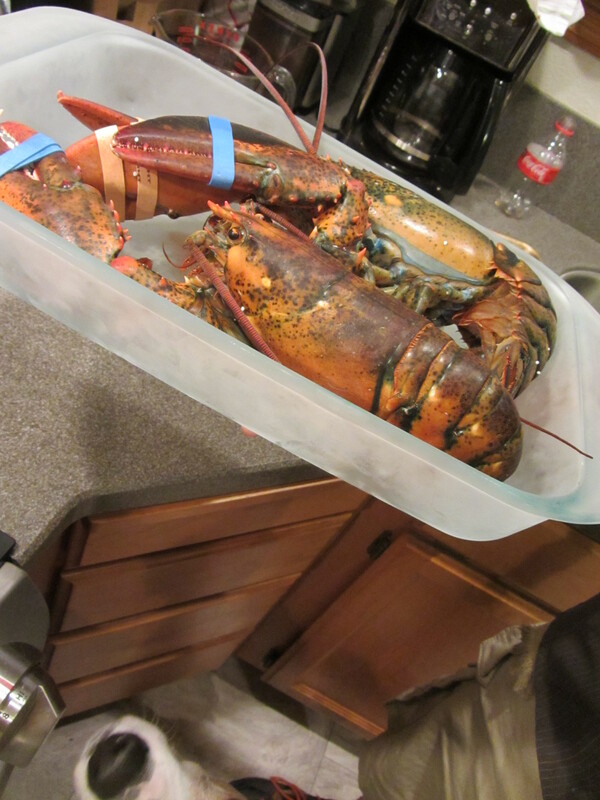 Lobster ready to be cut in half and prepped. This one’s claws fell off during steaming. Next, flip the lobster onto its back and cut again from the midpoint to the tail. Use your hands to pull the lobster apart at the midline. The tail portion of the shell will still be intact on the back side of the lobster, so you will sort of have a lobster bowl, with all of the meat exposed in the center. There will be some very obvious organs and such in the cavity that you want to scoop out with your hands and discard. 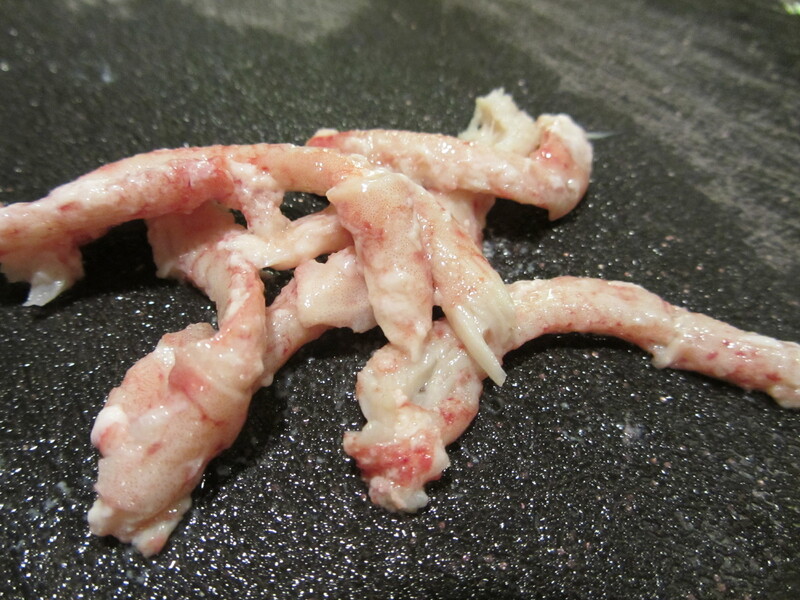 Essentially, the top half of the lobster will be an empty cavity after you remove the organs. 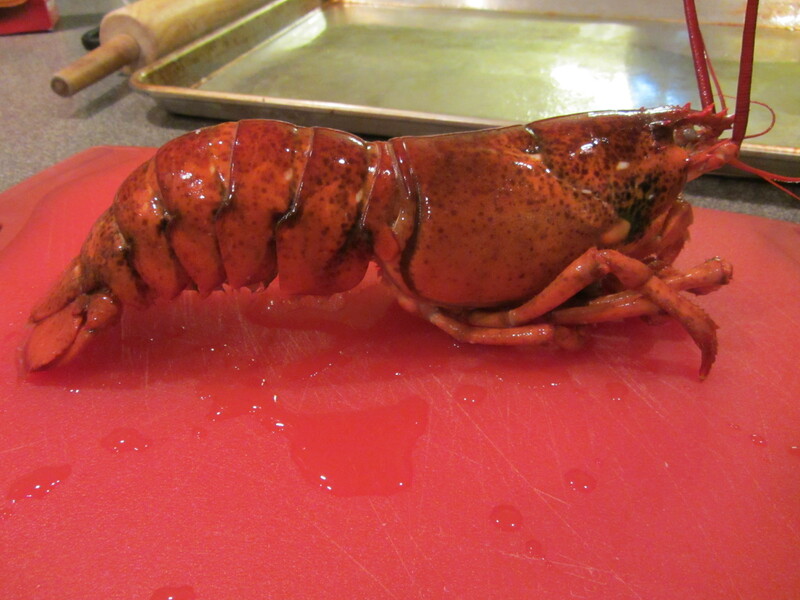 Next, pull off the lobster’s legs, and roll over each leg with a rolling pin to push the meat out. I was skeptical of how well this would work, but it worked like a charm. Set the leg meat aside. Legs pulled off of lobster. Meat from legs using a rolling pin. 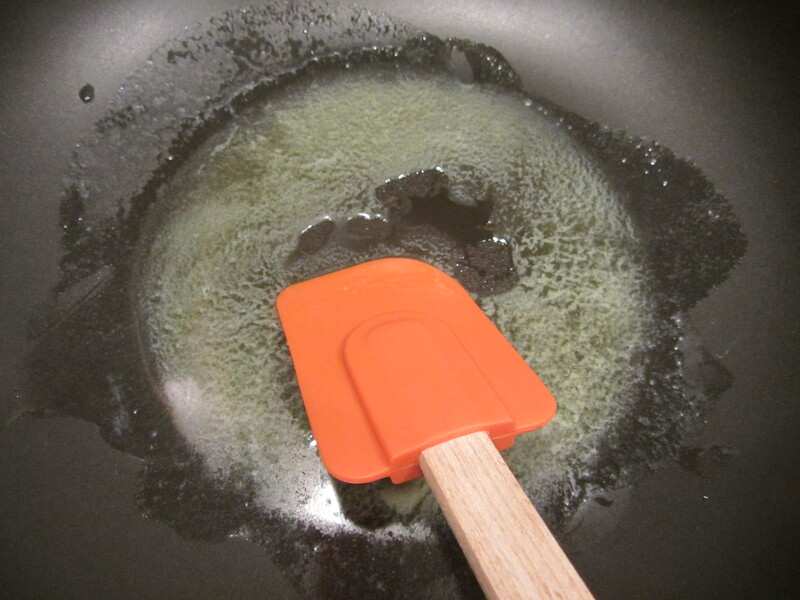 In a saute pan, melt 1 T butter per lobster and sweat 2 T of onion per lobster. Add 1/4 t lemon zest (I added a bit more) and 1 T scallions. 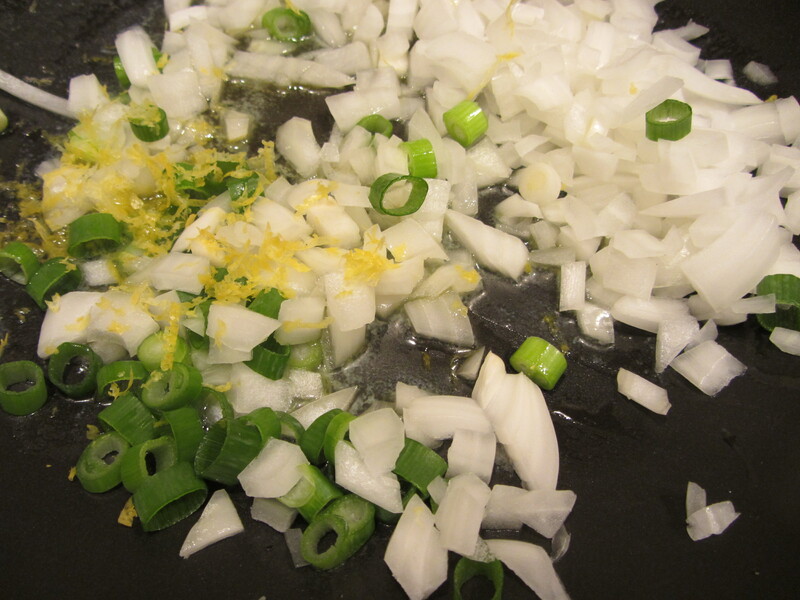 Onion, scallions, and lemon zest added to butter. When the onions are translucent, add the lobster leg meat, breaking it up with your hands, and toss the mixture over low heat for about a minute. Leg meat added to onion mixture. Add some grinds of black pepper and five Ritz crackers, crumbling them with your hands. 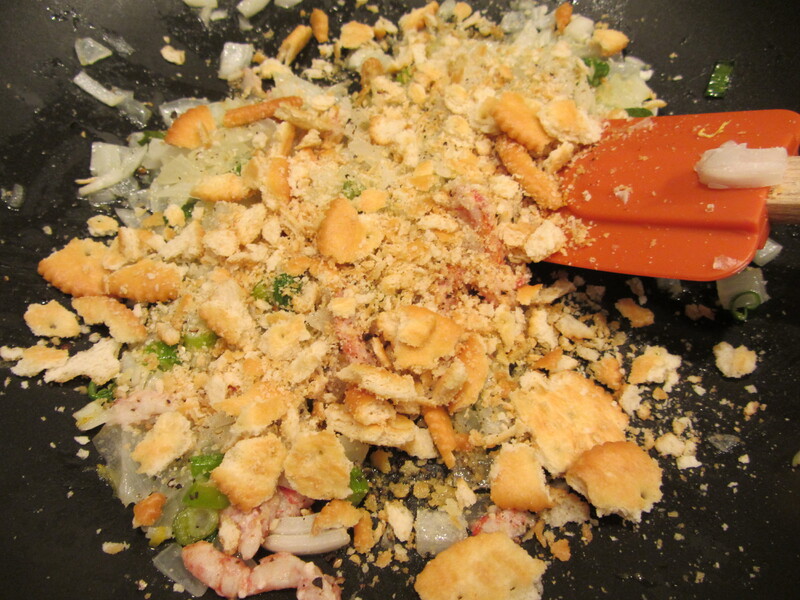 Turn the heat off and toss this mixture until all of the liquid is absorbed by the crackers and the mixture looks dry. You may need to add more crackers, which I did. Ritz crackers and pepper added to filling mixture. Set this mixture aside. 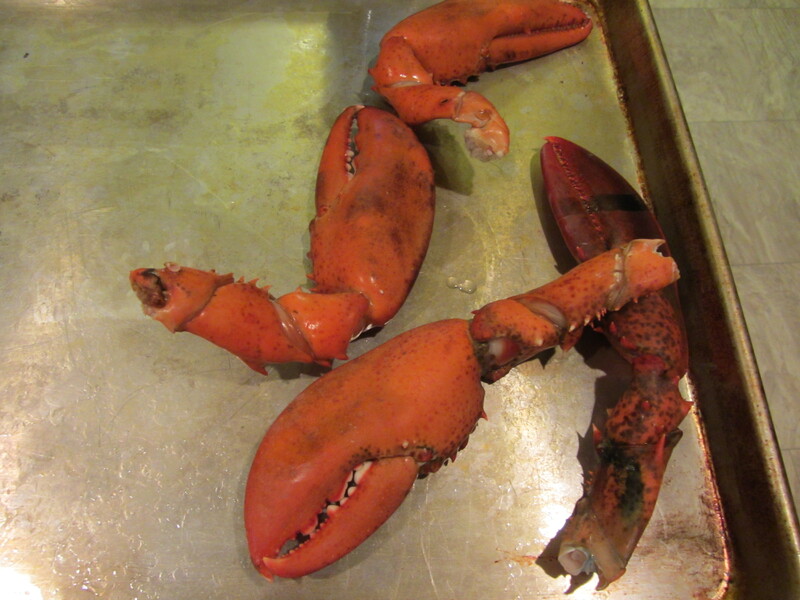 Preheat your oven to 450 degrees and cut the claws off of your lobsters, also cutting the bands off of the claws. 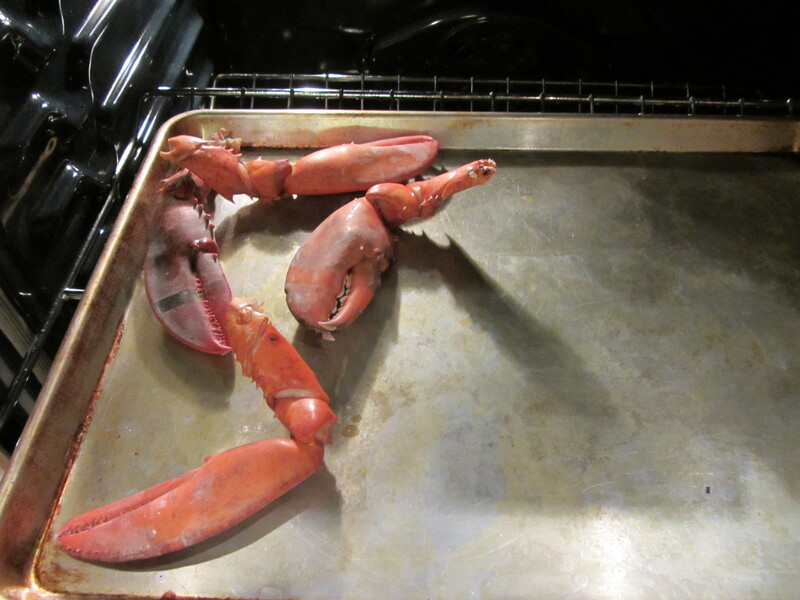 Place the claws on a baking sheet and roast in the oven for 4 minutes; the claws need a bit of additional cooking time over the rest of the lobster. Claws into the oven to roast for 4 minutes. 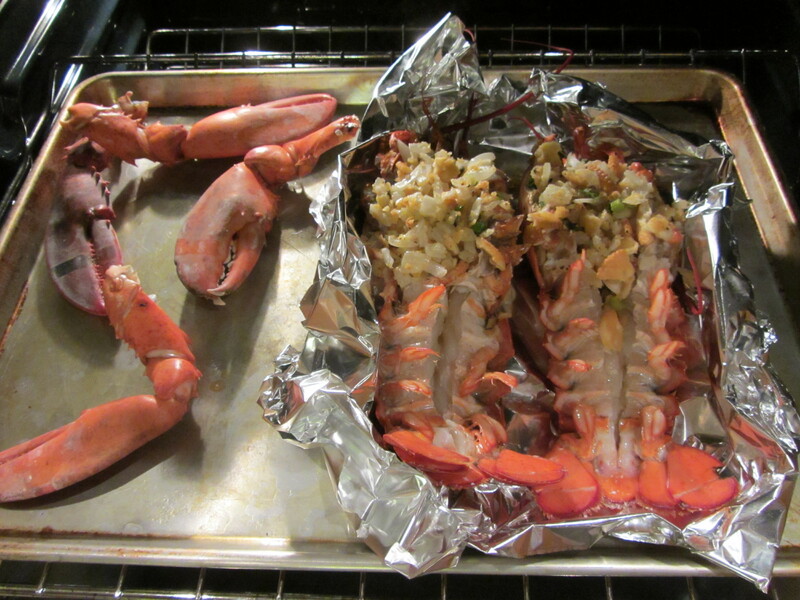 While your claws are roasting, place your lobsters on a sheet of foil, scrunching it up to make a level platform for them to nest in. Cleaned lobsters, ready to be stuffed. 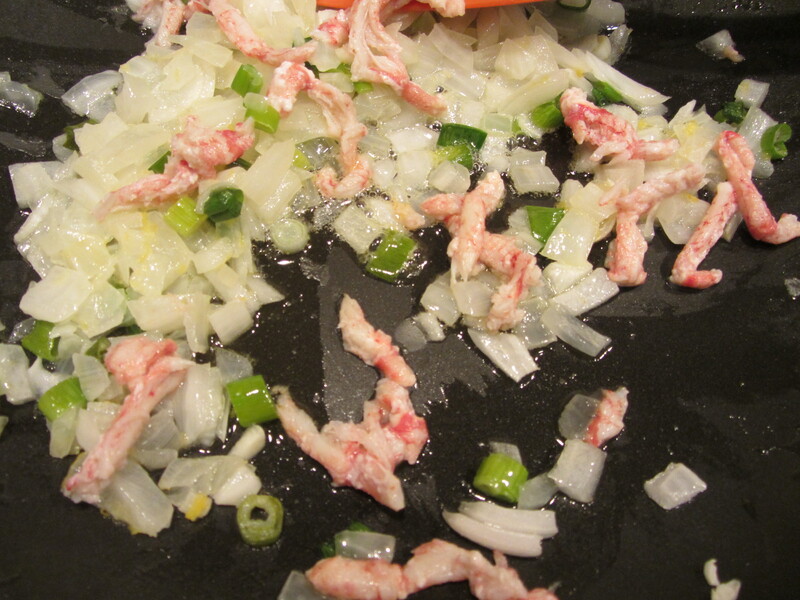 Loosely spoon the cracker/onion/leg meat mixture into the open cavities of the lobsters, avoiding packing it in, and brush the tail meat with some olive oil. Lobsters, ready for the oven. Tails brushed with olive oil. When the four minute head start for your claws is done, add the lobsters to the pan with the claws. Depending on the weight of your lobsters, you will need to adjust the roasting time. 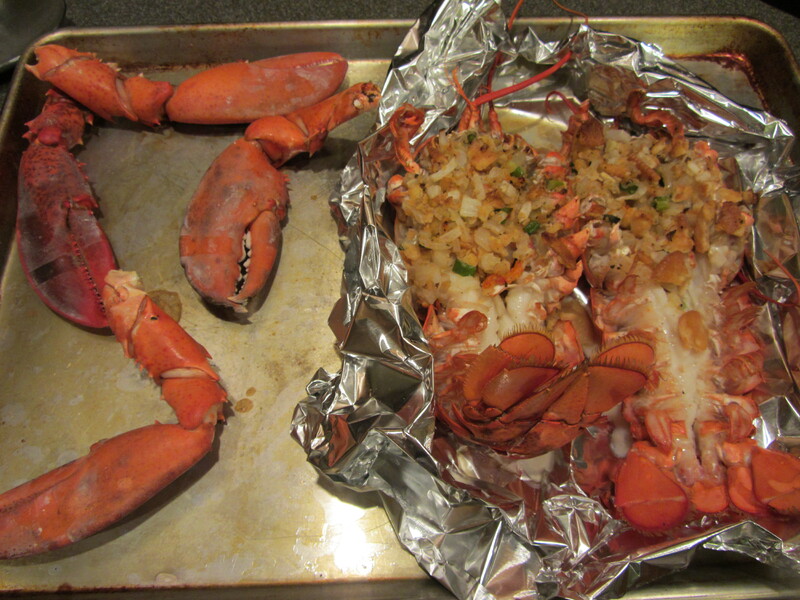 For 1.5 lb lobsters, roast them for 14 minutes. In the episode, Alton has a chart of roasting times for respective lobster weights. Claws after 4 minutes in the oven. When your lobsters are done cooking, remove them from the oven and crack the claws. Lobsters after 14 minutes in the oven. You first want to crack the pincher and wiggle it from side to side until you can slide the shell off. Then, crack the other portion of the claw and push the meat out of the joint with your finger. This is easier said than done, but it can be done with some fiddling. 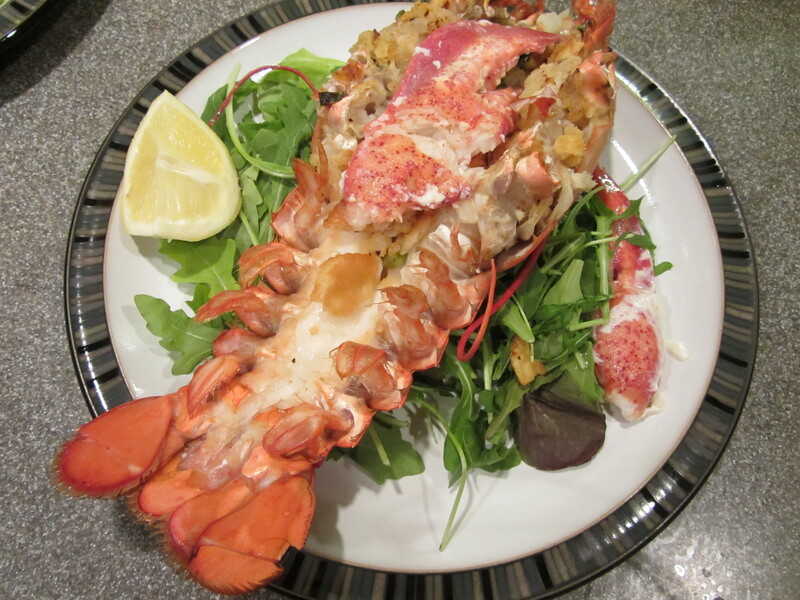 Serve your lobsters on a bed of greens with the claw meat placed on top, and melted butter and lemon on the side. Final stuffed lobster with claw meat on top and lemon on the side. So, how was Alton’s stuffed lobster? Ted and I both thought this was delicious. It was rich and sweet, and the meat was cooked perfectly. The buttery flavor of the Ritz crackers paired perfectly with the lobster meat and the lemon zest cut the richness. We had our lobster with a Chardonnay and that pairing worked nicely. I would definitely make this again, and I already have it on my list for potential holiday meals. 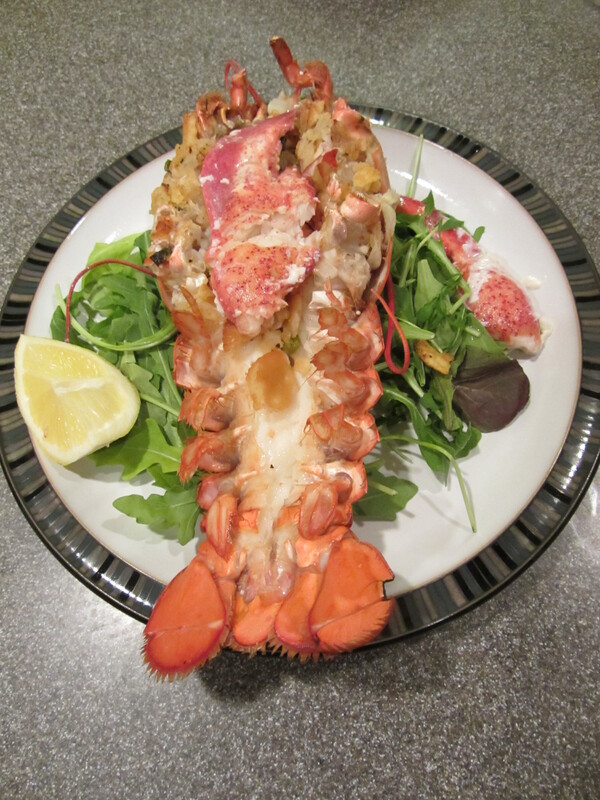 For lobster purists who like to pick the meat out of the shells yourselves, this preparation is probably not for you. However, if you want to enjoy the flavor of lobster with minimal work at the table, this is the way to go. It is definitely safe to say that I am a lobster fan after this one.